Background: 2-Indolinone is a bicycle, heterocyclic compound analogous of indole skeleton containing a carbonyl group at 2-position of the 5-membered ring. Recently, different biological evaluations of oxindole derivatives have been reported. A variety of compounds with oxindoles moiety exhibit useful pharmaceutical properties like anti-inflammatory, anti-bacterial, anticancer, anti-proliferative, anti-hypertensive, anti-HIV and anti-convulsant activities. Methods: In the present study, fifteen 6-chloro-3-oxindole derivatives (1-15) were screened for urease inhibitory activity. The binding mode of the synthesized compounds was studied by molecular docking and found good results. 6-Chloro-3-oxindole derivatives 1-15 were synthesized from 6-chlorooxindole by refluxing with different aromatic aldehydes in ethanol in the presence of piperidine in high yields. Docking was carry out of the ligands into HCV NS3/4A protein. The software package MOE (Molecular Operating Environment) was used for docking. Results: Our present study has shown that compound 6 (IC50 = 13.34 ± 1.75 µM), 2 (IC50 = 16.67 ± 1.73 µM), and 5 (IC50 = 17.85 ± 2.21 µM) were found to be the most potent urease inhibitors as compared to the standard thiourea (IC50 = 21.1 ± 0.11 µM). Conclusion: Our present study has shown that Compounds 6 (IC50 = 13.34 ± 1.75 µM), 2 (IC50 = 16.67 ± 1.73 µM), and 5 (IC50 = 17.85 ± 2.21 µM) were found to be the most potent urease inhibitors as compared to the standard thiourea (IC50 = 21.1 ± 0.11 µM). 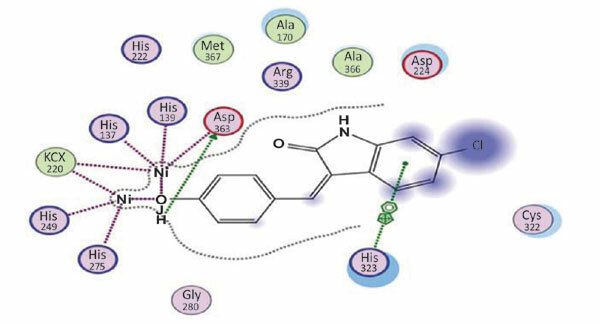 These may serve as lead compounds for better urease inhibitors after fine tuning in the structure and further studies in future. Keywords: 2-Indolinone, urease inhibitor, docking studies, aromatic aldehydes, urease protein, MOE. Keywords:2-Indolinone, urease inhibitor, docking studies, aromatic aldehydes, urease protein, MOE. Abstract:Background: 2-Indolinone is a bicycle, heterocyclic compound analogous of indole skeleton containing a carbonyl group at 2-position of the 5-membered ring. Recently, different biological evaluations of oxindole derivatives have been reported. A variety of compounds with oxindoles moiety exhibit useful pharmaceutical properties like anti-inflammatory, anti-bacterial, anticancer, anti-proliferative, anti-hypertensive, anti-HIV and anti-convulsant activities.